Ever heard the story about the guy looking for his keys on a dark street? It’s a bit embarrassing, but many content marketers are doing the same thing. We’re not looking for keys, of course, but return on investment. And though we probably know that metrics like clicks and shares won’t show us where the ROI is, we focus on them, simply because they’re so easy to track. 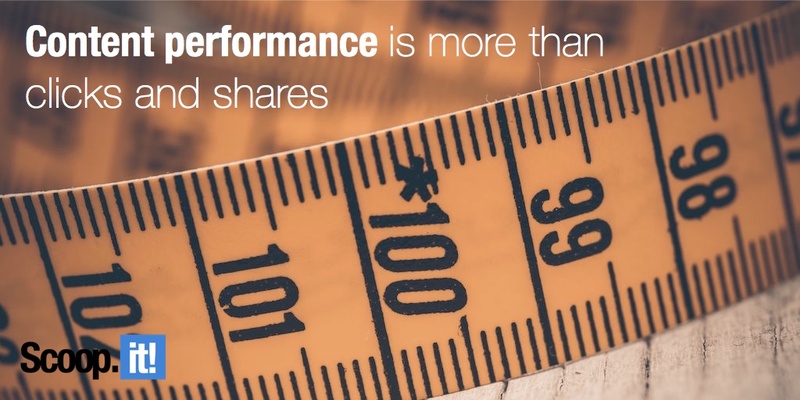 Most marketers measure their content’s performance based on share counts. Graph courtesy of BrightLocal. Unfortunately, that’s not the only reason we’re drawn to counting clicks and shares. There’s also peer pressure. Vanity, if you will. Which is exactly why metrics like clicks and shares and follower counts are called “vanity metrics”. They make us look good. If your higher-ups and not well informed, you might even need to make those metrics look good to keep your job. But they still don’t translate into real business. Of course, some marketers just want to increase exposure for their brand. They “just” (it’s no small task) want to get the company’s name out, make a splash, get people talking about their work. And that’s fine. For them, the more shares and clicks and followers, the better. But the rest of us – including most small and medium-sized businesses – we need results. Business results. Actions that translate into cold, hard cash. In other words, we need leads. 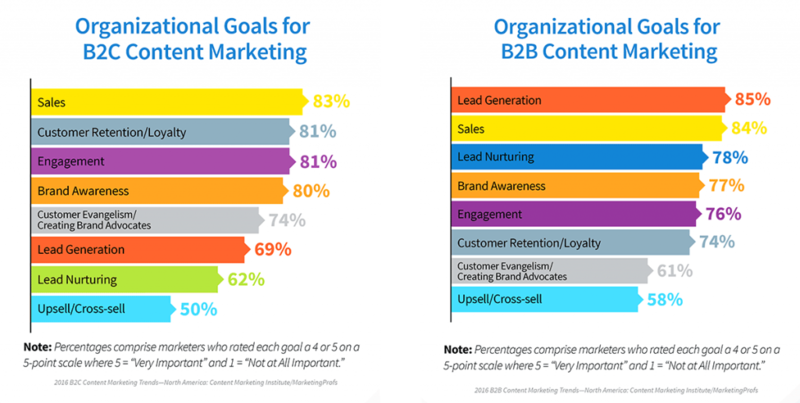 In fact, leads are the #1 goal for B2B content marketers, according to research from the Content Marketing Institute and Marketing Profs. 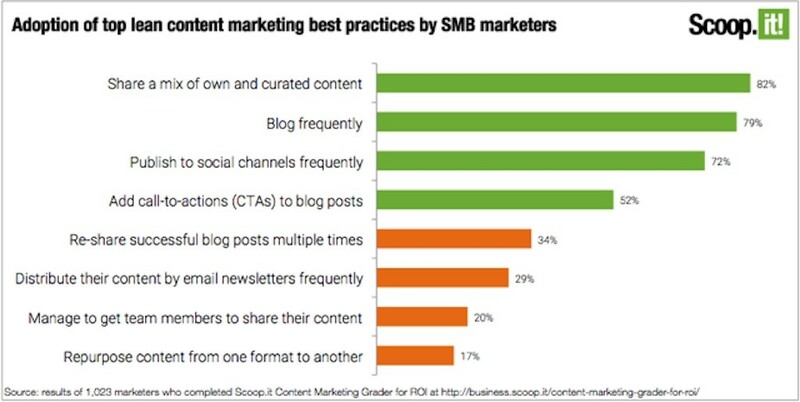 Even 69% of B2C content marketers – two out of three – say leads are a priority for their content marketing. Leads are where the rubber meets the road for most content marketing programs. Either leads, or sales… which are what most leads want to grow up to be. Because we need leads (and sales), just tracking clicks and shares can get us into trouble. And optimizing for clicks and shares can get us into even more trouble. Please note: I’m not saying shares aren’t great. We’d all like more of them. But when you drill down into why you’re really doing content marketing – and how to justify your budget – most of us need business results. And shares don’t necessarily translate into business. In fact, there’s ample evidence that shares don’t translate into people even reading your content. If you’re looking for more than just increasing brand awareness, the real metric to track is conversions. Namely, conversions for the call to action you’ve got at the close of every piece of content. You’ve got a call to action set up for every piece of content, right? Because if not… you’re leaving your audience without a next step to take. You’re taking all that work you did to attract the reader in the first place, to give them great content, but then when they’re done, there’s no next step for them. This happens way more often than you’d think. Almost half of the content marketers who have used our Content Marketing Grader assessment aren’t including a call to action. The good news is that adding a call to action isn’t terribly hard. And with the right tools (like Scoop.it Content Director), you can automatically get a list of which posts have a call to action. Of course, you don’t want just any call to action at the close of every post. You want a call to action that moves people along through the buying process, often called “the buyer’s journey”. So think of each call to action as a next step. Say you’ve published a blog post about wool yarn. You’d want to follow up with a piece of gated content (“gated” being content that requires the user fill out a form) that’s related to yarn. Maybe an eBook about all the different types of yarn and which projects are suited to each type. If you were an accounting company, maybe you’d want to follow up a blog post about finding deductions around your home with an eBook about all the possible deductions available. Or an eBook about how to ethically reduce your tax bill. Worst case, even if you don’t have any gated content assets ready, you can always default to your newsletter. Just getting people’s email addresses is a perfectly good start. With your call to actions in place, the next step is to track them. This is laying out the digital breadcrumb trail through your content. You’ll use to discern which pieces of content are profitable later on. For a high-level guide to all the ways to measure how many leads your content is generating, see our blog post, “How to Efficiently Measure the Impact of Content Marketing on Lead Generation“. Take a deeper dive on how to set up lead tracking in our eBook, “How to generate leads through content marketing”. It lets you identify top-performing posts. With this information, you’ll know which posts to prioritize for re-sharing to your social media accounts. It helps you evaluate which new content ideas are most likely to generate business results. If you look at posts with a low conversion rate, you’ll see which posts are under-performing, and might need a different call to action. If you look at posts with a high conversion rate but low traffic, you’ll see posts that deserve more promotion. Or maybe a little bit of extra SEO optimization. By knowing which posts are your top performers, you’ll also be able to prioritize which posts get updated most frequently. And which posts are the best candidates to be repurposed into other content formats. With information like that, you’re getting truly dangerous. Not only can you tell which content is working, but you can optimize it further for even better results. 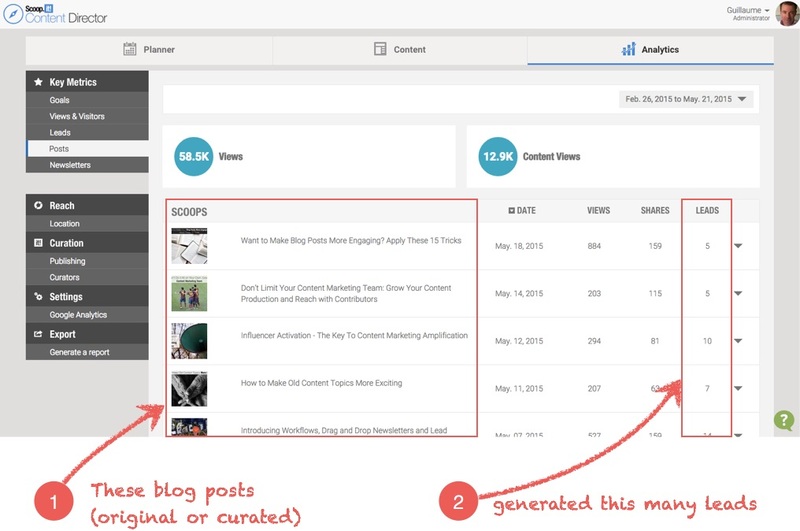 Scoop.it Content Director shows you the count of visits, views, shares and leads for every piece of content you’ve published. You can sort by conversion rate, traffic – any column you see here. Just as some clicks are more valuable than others, some leads are more valuable than others, too. Marketers know this. Sales people know it even better. Maybe that’s why lead quality has become even more important to marketers than lead quantity. 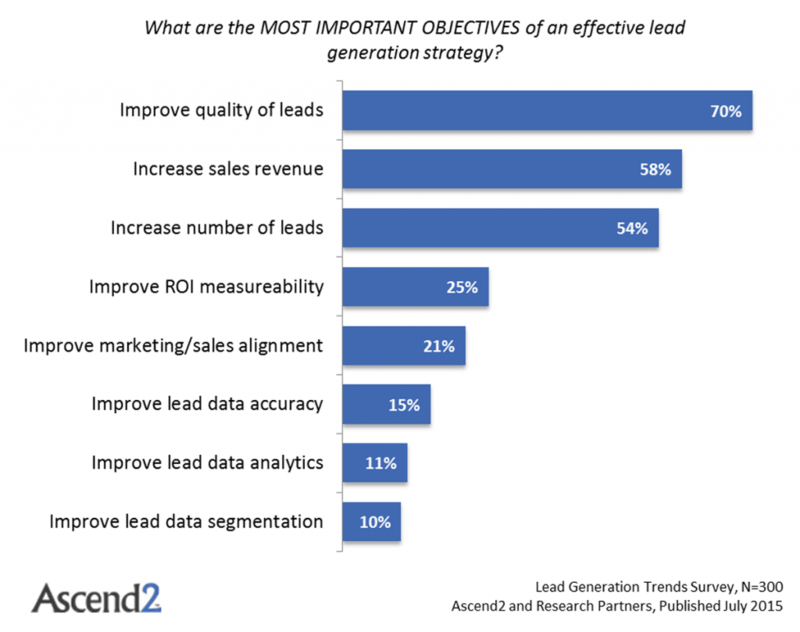 That’s according to Ascend2’s last survey of lead generation best practices. 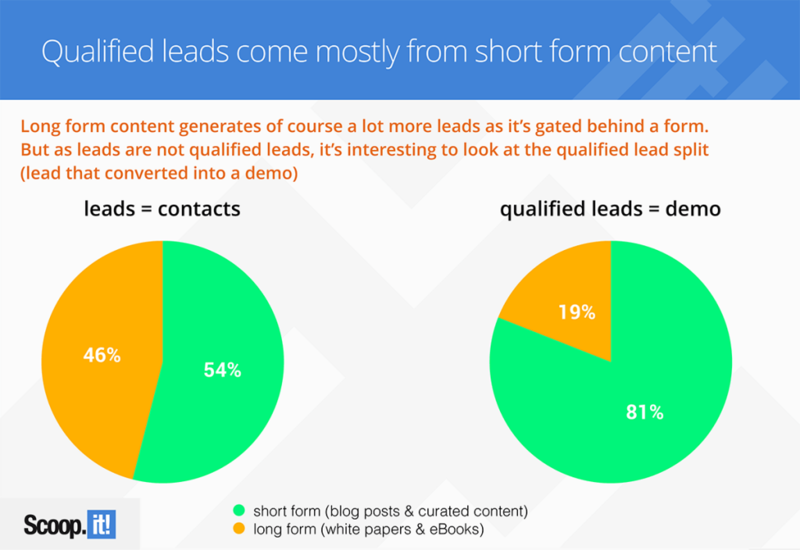 We saw this in our own analysis when we compared the performance of long versus short content. The graphic below is from the eBook, How to generate leads through content marketing. For us, qualified leads (sometimes referred to as “MQLs”) are leads that are have seen a product demonstration. Obviously, we’d like to optimize our content marketing efforts to get more of the highest-quality leads. So you’ll need a tool that can help with that, too. You can do it through lead scoring, or by tracking which leads convert again by viewing demos, downloading whitepapers, and more. That’s the type of information that’s the ultimate proof of content performance. Tools like Scoop.it Content Director make it possible. You can also track people with Google Analytics, or patch different tracking systems together in a patchwork, but it takes far more work. It’s time to make our content marketing more efficient, but also far more effective. Tracking metrics that really matter is a good start. But so is using tools that can interpret those metrics, and our content’s performance, to get us ever better results. Got a beef? An insight? 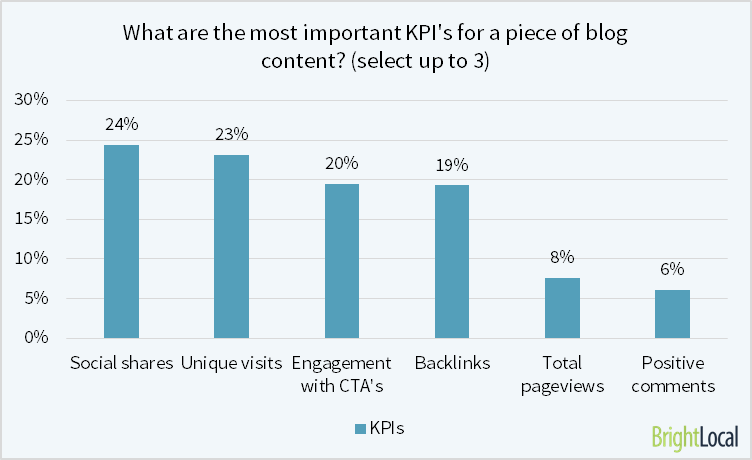 A tip to share about tracking content ROI? Speak up and leave a comment. We want to know what you think. Want to get more leads and better results from your content marketing? Find out how the new Scoop.it Content Director can help!